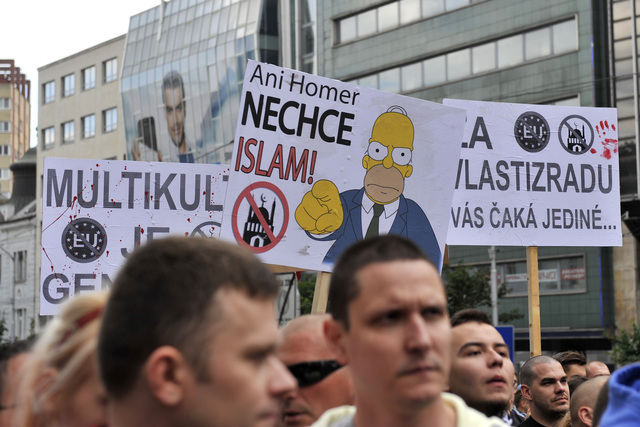 A photo from the 'anti-Islamisation' protest (Credit: Jan Koller/ČTK). A recent far-right rally in Bratislava, Slovakia attracted thousands under the ‘Stope the Islamisation of Europe’ banner. Protesters included Marian Kotleba, founder of the far-right Our Slovakia party, and governor in a central region of Slovakia. “I wish you a nice, white day… we are here to save Slovakia,” Kotleba told the crowd. Kotleba’s speech contained the hallmarks of white supremacism: protecting ‘our’ nation, children, and state. A protection ‘compromised’ by the ‘liars’ in parliament. Kotleba is the former leader of a banned neo-Nazi party and sympathetic to Slovakia’s wartime Nazi puppet state. A paroxysm of bigoted chants including “This is our home!” “Slovakia to Slovaks!” and anti-American slogans accompanied the speeches. The protest in Bratislava is a synechode. It forms part of a larger story: how the far-right exploits the cultural anxieties attached to Muslim communities in Europe in the age of global migration. Other speakers included Jiří Fronek, of the Czech far-right Workers’ Party of Social Justice. Violence broke out during the protest as some protesters carried knives and fake explosives. Police made over one hundred arrests. Local media claimed 8,000 attended the protest, as organisers put the figure at 6,000. Other Slovakian suggested the true figure fell between 3,000 and 5,000. After the rally, violence extended to other sections of Bratislava, including a cycle rally. At the main train station, an Arab family had stones and bottles thrown at them. Slovakia’s Muslim population totalled just 0.2 per cent of the national population in 2010. More than two-thirds of the population self-identify as Roman-Catholic. With that in mind, anxieties around are easier to manipulate. A recent poll indicated that immigration remains a top concern for Slovaks.